Peppermint tea may be more useful than just a refreshing way to help break up a hectic day; a new study suggests it can also improve both short- and long-term working memory. The research, presented at the British Psychological Society’s Annual Conference in England last week, adds yet another health benefit to peppermint tea’s impressive resume. 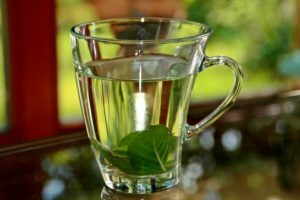 Results showed a link between peppermint tea and enhanced mood and cognition. Those who drank peppermint tea also exhibited improved long-term memory, working memory, and alertness. On the other hand, volunteers given chamomile tea experienced a calming sedative effect, which the team noted also seemed to slow their memory recall and attention speed. 1. Do you have a favorite tea? 2. Herbal tea is made from herbs, fruits, seeds, or roots steeped in hot water. Limited research has been done on the health benefits of herbal teas, but claims that they help to shed pounds, stave off colds, and bring on restful sleep. What do you think of herbal tea and herbs in general? 3. What herbs are popular in your area and for what are they used? that affect your mood and how do you handle them?